Now You Are Ready For Your Next Party! Jalapeno poppers are tasty little appetizers with some zip. They are the perfect appetizer for that Superbowl, Christmas, tailgate, or bachelor party. These work for any occasion. You can make them pretty spicy or not. Better yet, do a little of both. Just remember to label them for your guests. I know when I have guests over, there are always some people who like it really hot and some who can’t handle much heat at all. With this recipe you can serve it both ways by adjusting your jalapeno peppers. And what do I mean by that? Well, since most of the heat in peppers is found in the seeds and membranes of the chile; to make them fairly mild in heat, just remove all the seeds and membranes. In this picture below, the pepper on the left has all its seeds and membrane intact. I literally just sliced it in half. Beware, this is only for those brave souls who really like it hot. The chiles on the right have had their seeds and membranes removed with a knife. This really cuts down on the heat. Just about anyone can eat these. You can also prepare your jalapeno poppers with medium heat by leaving in a few seeds if you like. Another option is to remove the seeds and membranes, chop them up and add them back to the filling. Speaking of hot, when you are working with chiles, please be aware not to touch your face, especially your eyes as the oil in the chiles can burn you. Latex gloves are really a good idea to wear if you have them. Otherwise wash your hands with soap and water after handling the jalapeno chiles. These jalapeno poppers are baked. I chose that style of cooking them for several reasons. Deep frying and pan frying is messy with grease splattering everywhere. Baking is healthier than frying. Flavor is just as good or pretty close. Baking is less time consuming. I also want to add that these appetizers are easy to customize. What I mean by this is that you can add or substitute just about any ingredient you want. Let’s say you don’t have cheddar cheese but you have jack or some other kind. You can substitute it. Or you are crazy about green onion. Chop some up and throw it in. There really is nothing you can’t add. So feel free to get wild and try anything you like or happen to have on hand. In fact, I have even heard of someone making jalapeno poppers with peanut butter. Who would have thought? Let me know if you have a delicious variation of jalapeno poppers. So start with this recipe and see how you like it. I’ve got plenty of Mexican recipes to compliment this appetizer. Guacamole dip would be awesome with this recipe. I can just taste some velvety avocado on top of my popper. Yummy. Entertaining is easy with our Mexican casserole and maybe some chile verde. Finish things off with some refreshing margaritas. Now you are ready to party. Fry the bacon until crisp and set aside. Preheat your oven to 350 degrees F.
Rinse the peppers and then pat dry. 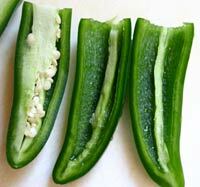 Slice off the stem and then cut the jalapenos in half lengthwise. Take a small knife and remove as much of the seeds and membranes as you like. Remember, the heat is in the seeds and membranes. You can also rinse the pepper again after removing the seeds to help in eliminating those hot oils. In a medium bowl, add the cream cheese, parmesan cheese, and garlic, and mix well. If you like a lot of heat you can add those seeds and chopped up membrane back into the cream cheese mixture. Crush the bacon with your hands and add to the mixture and stir until well blended. Spray a cookie sheet with Pam or similar oil. 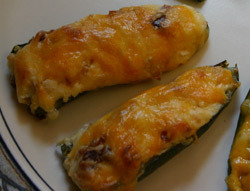 Using a spoon, mound the cream cheese mixture into the jalapeno pepper and top with a sprinkle of cheddar cheese. Push the cheese into to the cream cheese mixture so it sticks. Place the stuffed jalapeno popper on the cookie sheet and continue until all the peppers are filled. Want To Grill Your Jalapeno Poppers Instead? You can even grill these on the BBQ if you like. I have a gas grill so all I did was turn the BBQ on to medium heat. My grill has two burners so I only turned on one. You want to use indirect heat so make sure you place the poppers away from the flame off to the side. One other thing I did in grilling these was, instead of adding the bacon to the cream cheese mixture, I wrapped each popper with a piece of uncooked bacon. Your cooking time will be about 30 minutes or until the bacon is cooked and crispy. I froze some poppers after baking them and then reheated them in a 325 degree F. oven for 10 to 12 minutes and they turned out great. You can also make these up and freeze them for baking later. Just make sure you wrap them well and place them in a ziploc type bag. Then all you have to do is pop them in the oven at 350 degree F. for 30 minutes. Now you will have tasty party appetizers ready at the spur of the moment. P.S. A reader of mine wrote in with a comment about how to get more flavor into the poppers. He suggests placing the peppers cut side down on a baking sheet. Place under broiler and roast the peppers until skin is charred brownish/black. Turn over and fill peppers as per my recipe. Put back into oven and follow my baking procedure. MMMMMMmmmmmm good. Love Jalapeno Poppers but looking for more appetizers?